No. 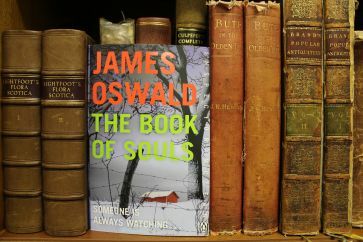 10 in the series ‘The Book of Souls’ by James Oswald meets some books from the Bute Museum Library. It thought it could hide amongst antiquarian books like ‘Bute in Olden Times’ but it was quickly spotted. The library of the Museum contains many interesting old volumes and is also kept current with the addition of any new publications relevant to the island. James Oswald is the author of 8 books in the acclaimed Inspector McLean series, crime novels with a supernatural edge to them. He will be in Bute Museum on Friday 3rd August, getting events under way with ‘A Starter for Tension’ and then again on Sunday 5th. 1st October to 30th November.